ENSENADA, Baja, Mexico – (Nov. 23, 2010) – Team General Tire and the General Tire Grabber competition tire took on the desert once more at the 43rd annual Tecate Baja 1000, which stretches from Ensenada to La Paz, Mexico, and results in the longest version of the SCORE Baja 1000 known as the Peninsula Run. 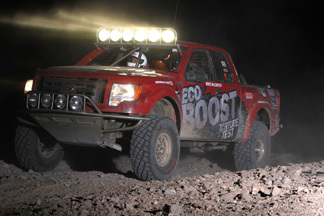 Team General Tire was primed to unleash its fury on the desert’s most fearsome course for its third consecutive season. 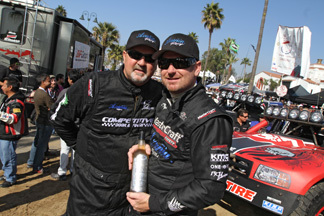 Finishing at the top, was the unstoppable team of Kent Kroeker, who placed second in Class 8 and “Ballistic” BJ Baldwin who took home fourth place in Trophy Truck. For the first time in Baja history, a TrophyLite truck won first place in Class 7-2. Jim Riley, Rick L. Johnson and Matt Dowland took the leading position in the TrophyLite, driving the entire race on General Tire AT2 tires. Stealing first place in the Stock Engine Truck class, Mike McCarthy, Robbie McCarthy, and Greg Crowther charged the finish line in their Ford V-6 Eco Boost F-150 on General Tire Grabber tires. the Pro Truck class, the top finishers were Rob Reinertson, Rob Clouser and Bob Neth in their Ford F-150; taking home second was Nils Castillo, Joe Custer and Gene Haas in their Chevy Silverado; and third place went to Troy Vest, Geno Lecitra, Alan Levinson and Doug Poole also driving a Chevy Silverado. 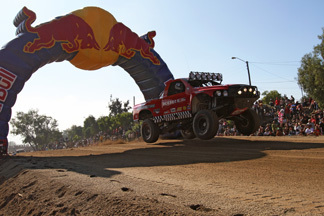 The General Grabber is the spec tire of the Pro Truck class. The Grabber competition tire is designed with a tough, three-ply Duragen™-reinforced body construction to stand up to the rigors of off-road conditions, the Grabber also features a newly-developed competition-specific tread compound. In addition, the Grabber name and General Tire logo are prominently featured on the sidewall in red and white letters. The Grabber competition tires are designed in size 37×12.50R17 for class 8 and trophy truck/trick truck and 35×12.50R17 for class 1, 6, 7, 7 S, stock mini and Protruck. General Tire also has a complete line of Grabber tires for the passenger and light truck market, including the new Grabber DOT-approved off-road tire (available now); the Grabber HTS, which delivers the perfect synergy of comfort, durability and performance; the Grabber UHP, which sets a whole new standard in performance and ride quality for SUVs, light trucks and crossover vehicles; and Grabber AT2, designed for aggressive all-terrain traction in all weather conditions.